On Saturday June 9th (6-9 PM) for the first time, Gallery Nucleus is collaborating with Nobrow for an exciting exclusive U.S. book release of Nobrow 10: Studio Dreams (Special Edition). The critically acclaimed series has long been seen in our shelves and we're thrilled to celebrate Nobrow's 10 years publishing beautiful books! 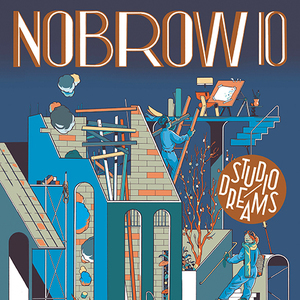 The 10th Nobrow magazine features 70 artists responding to our theme of ‘Studio Dreams’. This will be a number stamped limited edition hardback with a foiled four spot colour printed cover and a dust jacket poster. World-renowned creators turn their hand to creating their dream studio spaces (whatever that might mean for each one) in this unique international showcase containing over 100 pages of illustration. Some of those creators will be in attendance to sign copies of Nobrow 10!